Talk about a good dog!! 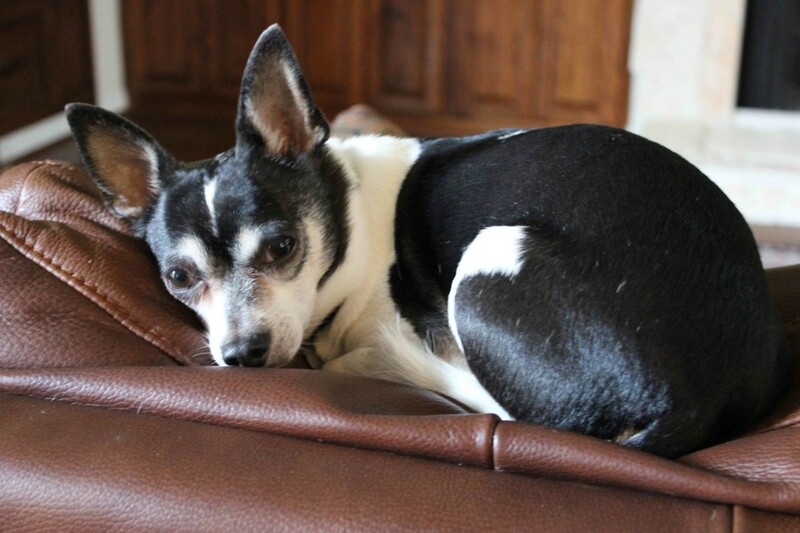 I know everyone says they have the best dog in the world, but does your dog have as much patience as Skippy, our 10-year old chihuahua, pictured above? I mean, talk about self control! Look at Skippy….just eying the cookies. Waiting patiently for the cookie he will never get. They say chocolate can kill dogs, but if it did, Skippy would not be alive to this day! Four years ago when I was teaching school, my students gave me a few bags of candy for an upcoming holiday (it was either Christmas, Valentine’s Day, or my birthday…unfortunately I can’t remember). In the clear, cellophane-wrapped bags were Hershey’s Kisses, Reese’s Peanut Butter Cups, and M&Ms…. all chocolate! Well, I put the candy in my school bag, and when I got home, I placed my school bag where I placed it every day – tucked away in the corner near the kitchen table. It was a Friday night and Matt and I went out to eat as we always do on Friday nights. When we came home, you’d thought someone had broken in with all the mess that was on the floor! There were silver Hershey’s Kisses wrappers and brown Reese’s Peanut Butter Cup wrappers torn up in a thousand little bitty pieces scattered all across the floor. #tbt This picture is from 2008, before Matt and I were married. Look how young we all look! And then there was Skippy. His face pled guilty all over! While we were out, he had gone through my school bag, opened the cellophane bag containing all the candy and then proceeded to open and eat nearly 3/4ths of my holiday candy! Not only was I upset that Skippy ate the good stuff…there were no Reese’s left…. I was also upset that he would die from since “chocolate kills dogs”. Fortunately Skippy survived. 🙂 Not only did he NOT get sick, but he didn’t even have an upset stomach! 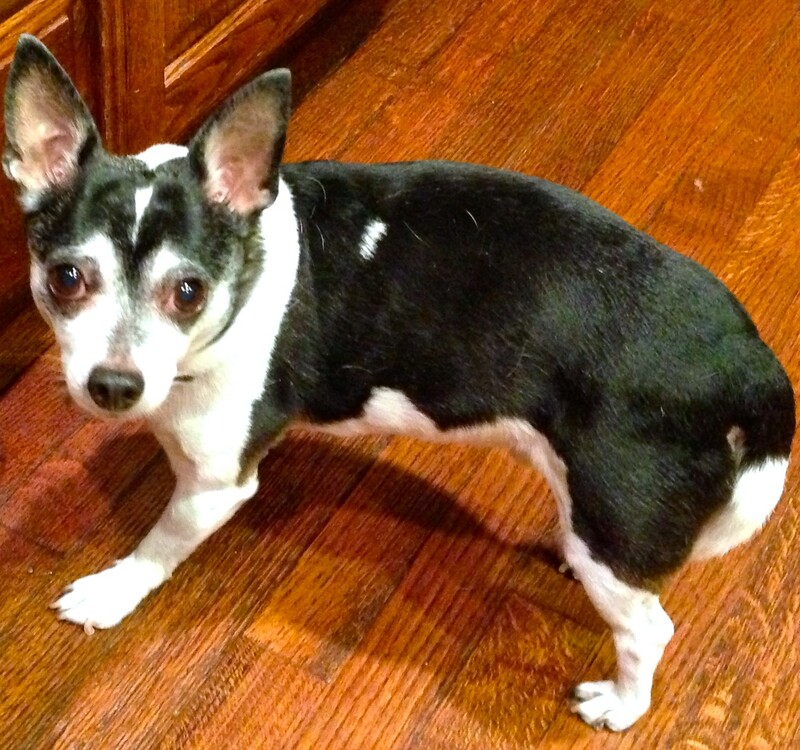 If you know Skippy, you’ve heard that he LOVES peanut butter…hence the name “Skippy” peanut butter right? lol. (We adopted him and his name was already Skippy). I think he smelled the peanut butter in the Reese’s and just couldn’t resist….plus he was bored, apparently. 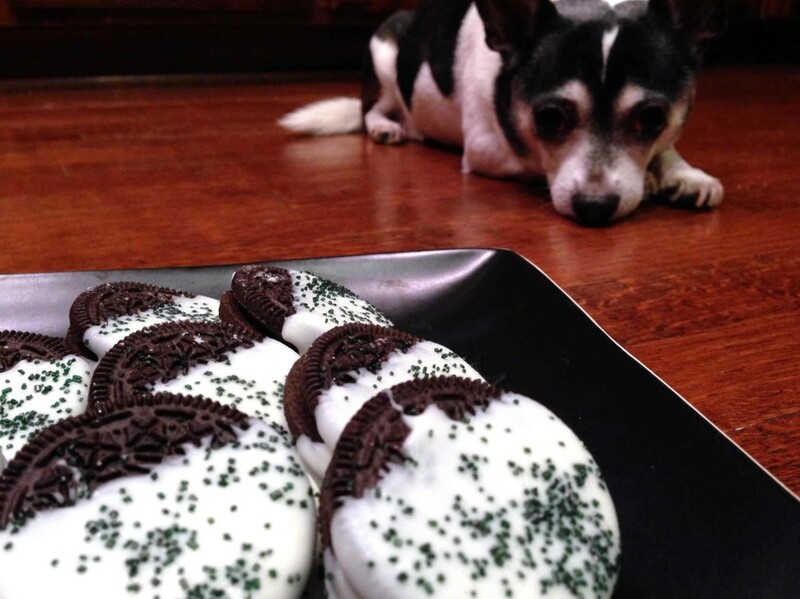 While Skippy is extremely obedient in person, (hence not eating the Oreos in the picture above), he is revengeful behind your back. He will act up when you are not around, so watch out! 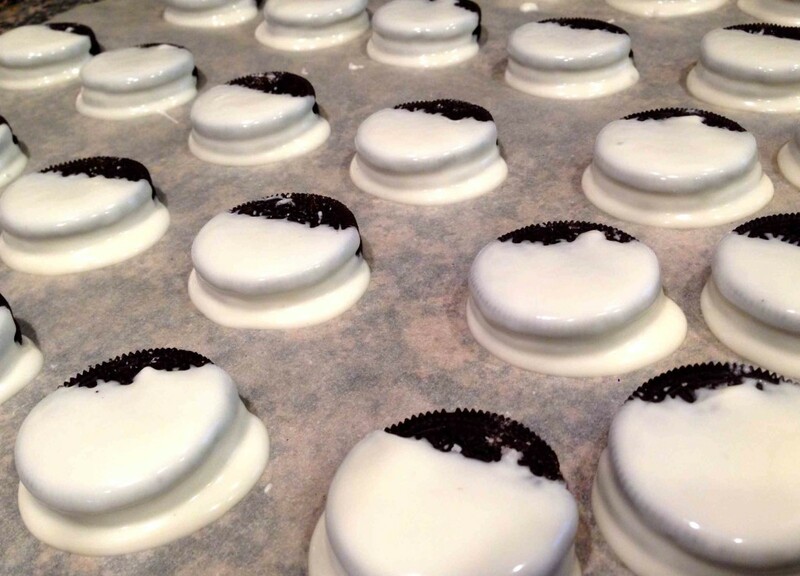 Anyways, if you’re a white chocolate and Oreo cookie fan, you’ll love these White Chocolate-Dipped Oreo cookies. I know they sell these pre-dipped at the store, but the homemade version is so much better. Melt your white chocolate bark (or vanilla almond bark) in a microwave. Dip 3/4 of the Oreo cookie in the white chocolate and place on parchment paper. Using whatever you have on-hand, you can decorate with any colored sprinkles while the chocolate is setting up. 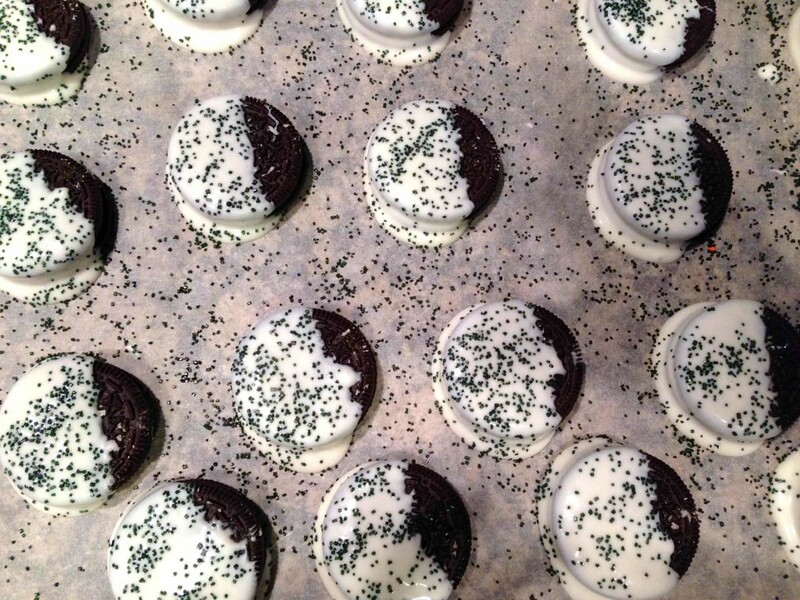 While cookies set, decorate with colored-sprinkles of your choice. I made these for the 2014 Super Bowl party that we hosted and they were a hit. Super simple and super popular. Enjoy! Melt vanilla flavored almond bark according to package directions. I melted the bark via the microwave. Dip three-fourths of an Oreo cookie into the bark and place on parchment paper to set and cool. Repeat until you use all Oreo cookies. While the cookies are setting up, decorate using colored sprinkles of your choice. I used black sprinkles. 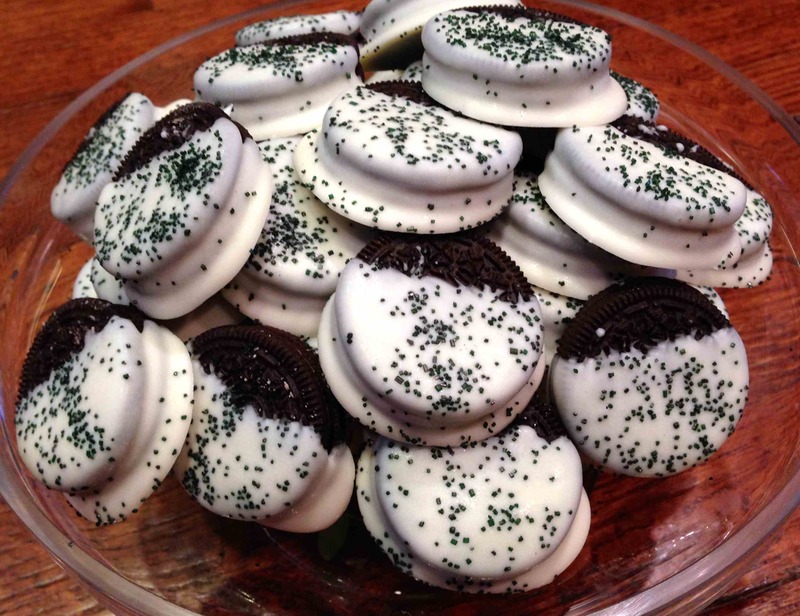 One Response to "White Chocolate-Dipped Oreos"